A Ho Chi Minh City court has sentenced a company director and his deputy to 3 years in jail each for smuggling 158 pieces of ivory tusks weighing more than 2.4 tons. Le Van Tu, 44, director of Thai Minh Import and Export Co Ltd, located in HCMC’s Binh Thanh District, and 38-year-old Tran Van Thai, Tu’s deputy, received the sentences at their trial opened by the city People’s Court on Thursday. 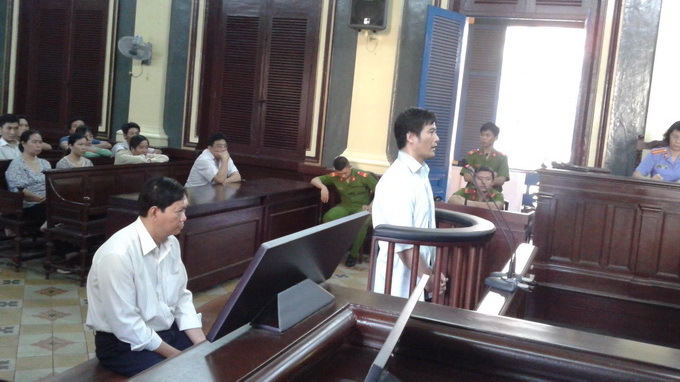 Along with the jail time, each defendant must pay a fine of VND10 million ($480), the jury said. The court also ordered that the tusks be confiscated. According to the indictment, the company filed a customs declaration to the customs office of the Saigon Port on June 29, 2013 to import 675 pieces of salt cowhide weighing about 2,400 kilograms worth US$53,375 from its partner in Singapore. As stated in Thai Minh’s declaration, the shipment was sent to Vietnam by Singapore-based MG Energy PTE LTD and was shipped from Maputo, Mozambique to the Phuoc Long ICD Port in HCMC. The goods belong to the commodities that are exempted from VAT when they are imported into Vietnam. As shown in the import file, the cowhide had undergone quarantine by the HCMC Port-Post Animal Quarantine Station, with the confirmation signature of a veterinary doctor, Tran Trung Nhan. As the company did not proceed with procedures for customs clearance for the shipment although customs has asked it to do so many times, customs decided to inspect the shipment on June 30. At the same time, Thai Minh submitted a document asking to cancel its declaration relating to the shipment, explaining that its Singaporean owner had decided to sell the cowhide to another buyer. However, when customs opened the shipment for examination, they found 158 pieces of ivory tusks. After being arrested, Tu and Thai confessed that they had ordered staff to make the customs declaration with false information. According to a recent report by the World Wide Fund for Nature, most ivory smuggled into Vietnam is destined for China, although some of the illicit goods are sold locally for US$770-1200 per kilogram. In both China and Vietnam, elephant tusks and other body parts are highly valued for use in traditional medicine and for decoration. Vietnam officially banned the trade of elephant tusks in 1992 to discourage people from hunting the country's dwindling population of elephants, which poachers value highly for their tusks. By far the biggest seizure of elephant tusks in Vietnam occurred in March 2009 when customs officers in northern Hai Phong city discovered nearly seven tons of the goods in a container shipped from Tanzania, a country in East Africa.